Revel in me...: My motivation. 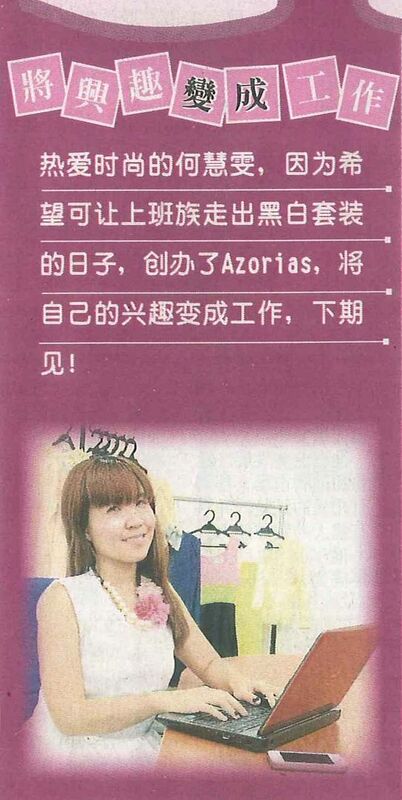 Last month, I was interviewed for the Pink Biz column for The China Press, which features women entrepreneurs who are making a difference in the society. Okay, here is when I let the cat out of the bag. I know Chinese. As in, I can speak, write, and read the language. Heck, I have been a straight-A student in the Chinese subject all my life. But somehow people always think that I don't know Chinese! Good for me though, 'cause then I know when someone is bitching about me in Chinese wtf. That being said, I was extremely nervous about the interview because admittedly, my spoken Mandarin has been quite rusty as I rarely get the chance to practice it nowadays. And maybe it's the yellow pride in me, I WANTED to speak in Mandarin during the interview (although it would have been perfectly acceptable for me to speak in English and the reporter will then translate). But I not only wanted to speak the language, I wanted to really be able to articulate my thoughts in it. I hope all of you can read Chinese wtf. I have been really blessed to be featured in a few publications for AZORIAS since its inception, but I think this is the most meaningful feature thus far. :) Because it's in Chinese, and hence my grandparents can read it, and have a better understanding of what I am doing, and hopefully they feel more reassured and, dare I hope for it, even proud of me. Y'see, my grandparents don't really understand what I am doing. They don't comprehend the concept of the Internet, of online shopping. They questioned why would people pay us in advance for goods that they can't touch or feel! They were born in a totally different era, and every few days they will tell me what a waste it is for me to give up my professional career, to let my qualifications go to waste. In fact, last year I joined some bazaars in my personal capacity to sell my own pre-loved clothes, and when they saw me lugging luggage bags into the car-- they actually thought I was selling clothes at the pasar malam (night market)! For the longest time, they were really sad and worried about my future. ... They got really excited. And kept on asking me how many copies should they buy. i got teary eyed reading this. I just gave up something important in my life to do what i really want to do and my parents are not supporting it at all. I hope i can be as successful as you so they finally can be happy for me. Awwww...it is really important to have family that's supportive. I just realize you know Chinese & also know how to speak mandarin..
anonymous: Haha yes they are! I've been reading your blog long before you started AZORIAS, and you truly are one of my biggest inspiration. Chasing your dream, and excelling in what you do best - plus your awesome sense of style! Once I graduate, I hope to be as successful an entrepreneur as you are. Currently taking small steps by running my own blogshop. AZORIAS is pretty much a household name online for stylish apparels. Soon, I'm very sure it will be known internationally!